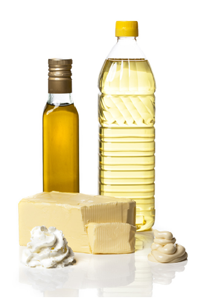 Triglycerides of fatty acids are major components of the fats and oils present in foods and living organisms, and along with fatty acids themselves, play a central role in human health. In addition, fatty acid triglycerides from vegetable oils are increasingly used in the production of biodiesel, and consequently they are also valuable in environmental forensics, for example in oil-spill attribution. Analysis of fatty acids is, therefore, an area of considerable interest. 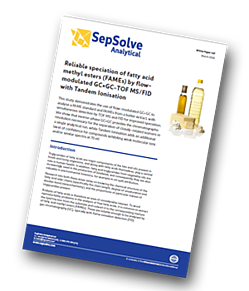 To avoid reproducibility problems in the analysis of free fatty acids, it is common to extract the lipid fraction from the substrate and convert it to the corresponding mixture of fatty acid methyl esters (FAMEs). These are volatile enough to be analysed by gas chromatography (GC), typically with flame ionisation detection (FID). In this study, the INSIGHT™ flow modulator for robust, repeatable and affordable GC×GC is used, and in addition, the benefits of parallel detection with time-of-flight mass spectrometry (TOF MS) and FID are described. This includes confident identification of targets and unknowns through the use of Tandem Ionisation for simultaneous acquisition of 70 eV and soft ionisation mass spectra. Samples: A 37-component FAME standard was prepared in hexane at a concentration of 200–400 μg/mL. The butter extract was prepared by saponification, derivatisation and solid-phase extraction clean-up. GC×GC separation was optimised using the commercial FAME standard. The full separation of all 37 components was achieved with an analytical run time of under 30 minutes, which would not be possible with conventional one-dimensional GC. This study has illustrated the power of flow-modulated GC×GC to provide simple, robust and affordable separation of FAMEs. The increased peak capacity enabled full separation of a 37-component FAME mix, including saturated and unsaturated homologues, cis and trans isomers and ω–3 and ω–6 isomers – all in a single 30-minute analytical run. In addition, the simultaneous acquisition of FID and TOF MS data improves the ability to identify and quantify targets and unknowns over a large dynamic range, while Tandem Ionisation adds an additional level of confidence in situations where 70 eV data alone cannot speciate similar compounds, without impacting laboratory workflow.